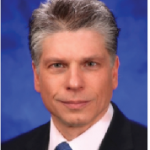 Home » Peer-Review » The midface – Filling, lifting, or blepharoplasty? Many patients seeking facial rejuvenation begin their inquiry with concerns about jowls, platysma bands, and an unsightly neck. They describe sagging brows and upper eyelids, bags under their lower eyelids, excess skin in the lower eyelid region, and an undesirable shape to their lower eyelids. They rarely seek advice to directly address their midface except when the specific midface aging changes and remedies are pointed out to them. They do notice what they perceive as deepening nasolabial creases in part because of the media attention to the nasolabial folds in regard to fillers. The patients also notice a flattening and laxity to their midface structures but frequently have difficulty describing exactly what is causing these changes. Patients usually do not understand why their nasolabial sulci appear to have become deeper and that they have a less attractive lower eyelid region than they did a decade previously. Until the late 80s and early 90s, there was a paucity of popular techniques used for the correction of midface aging. It was already quite clear that a traditional facelift did very little for the lid-cheek junction or even the nasolabial folds. It was recognized that the maximum desirable impact of a traditional facelift was usually along the jawline and in the neck. Although various cheek and submalar implants were available, they were not universally used. The nasolabial fold itself was ‘attacked’ with a contradictory repertoire of liposuction, excision, and placement of early ‘fillers’ and implants. Catalyzed by the further knowledge and understanding of the descent of the midface structures that occurs with aging, there has been an expanding number of tools available to remedy various functional and cosmetic issues with the midface1,2. These tools include surgical midface lifts of varying aggressiveness, advances in blepharoplasty to both correct eyelid position and to preserve a youthful eyelid shape, an ongoing spectrum of lower eyelid fat removal versus fat repositioning, the use of various malar and orbital rim implants, and the most recent adaptations of volume replacement using both autogenous fat and off-the-shelf fillers. The surface of the skin remains a separate issue, with rhytids and skin laxity frequently requiring an intervention directed at the skin surface to cause collagen contraction and skin tightening, such as lasers and radiofrequency devices. It is helpful to consider the lower eyelid, the lid-cheek junction, and the cheek as a functional unit. The movement and the structural integrity of the area are interrelated. Several simultaneous deleterious changes occur to this set of adjacent structures because of aging. The various dynamic factors that appear to be behind midface aging include decreased skin elasticity and a relaxation of the cheek and orbital retaining ligaments, which comprise the connections to the skeleton, the underlying musculature, and the skin itself. There are also involutional changes in the fat compartments of the midface caused by both diminishing support of the fat compartments as well as fat atrophy itself. All this occurs while the orbital rims themselves undergo a loss of bone and a structural loss of projection3. 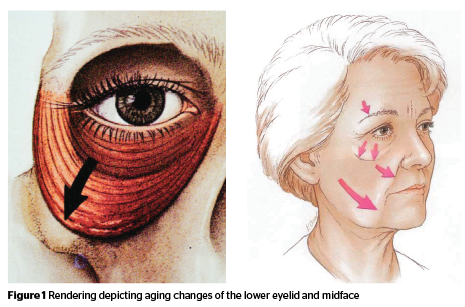 As a result of these changes, there is a descent of the eyelid margin, the orbicularis muscle lengthens vertically thus producing festoons and the cheek fat pad, which normally is retained high along the midface skeleton, descends into a lower position (Figure 1). The nasolabial crease becomes more pronounced. 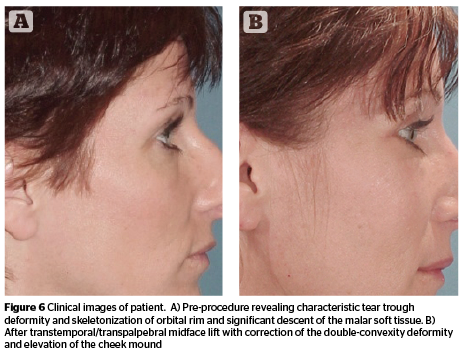 While there is less of an actual deepening of the crease, as the fullness of the cheek mound descends to a position adjacent to the relatively fixed nasolabial crease, the contrasting convex and concave contours create the appearance of a deepening sulcus4. At the lid-cheek junction, a characteristic deformity develops that is referred to as the double convexity of the lower eyelid and midface junction (Figure 2). This double-convexity is produced by the changing relationship of the convexity of the pseudo-herniation of the orbital fat, the relative concavity caused by the skeletonizing of the orbital rim due to the descent of the suborbicularis oculi fat (SOOF) and cheek soft tissue, and the convexity of the now lower positioned cheek soft tissue mound. In youth and in the rejuvenated face, this anatomic region has smooth contours as there is a gradual transition of the lower eyelid contour across the orbital rim to the cheek. With age, these components are separated from each other and the different contours are more apparent. These changes are accentuated or accelerated in patients who have a lack of skeletal projection to their orbital rim and midface and are considered as having a negative vector midface relationship (Figure 3). These negative-vector patients have prominent, attractive eyes in youth, but exhibit characteristic midface aging more readily. There is less support for the periorbital structures and the patients appear to have the propensity to develop an unattractive bowing of their lower eyelids, skeletonization of the orbital rim, functional eyelid retraction, and ectropion. In contrast, those patients with good midface skeletal projection or a positive vector relationship appear to have more support for the lower eyelid; in a sense, the projection acts as a functional shelf that the eyelid and associated structures rest on. The periorbital structures are, therefore, less prone to descend from decreased, age-related laxity of the retaining ligaments of the cheek. With the recognition of the anatomic changes that occur with aging, the popularization of new techniques and the development of new biomaterials, the treatment of the midface has changed appreciably over the last decade. This has resulted in a remarkable improvement in facial rejuvenation outcomes that were not achievable with traditional facelifting techniques. Due to the significant impact correction of this anatomic area has on overall facial rejuvenation, increased attention is now paid to the midface by facial rejuvenation surgeons. The contemporary cosmetic surgeon has a larger choice of tools to be used in response to the spectrum of anatomic abnormalities that is pres ented by the patient. The restoration of volume has taken on a predominant role. The deflation of soft tissue and skeletonization, such as the tear trough deformity, is largely managed through the restoration of volume using both fat and fillers. Patients are seeking correction at a younger age and volume restoration is frequently the first intervention to entertain. Mild and moderate abnormalities can be corrected adequately with either fillers or fat, and the achievable results are comparable to those possible with surgical techniques. The off-the-shelf fillers also add a compelling convenience factor5–7. This non-surgical intervention can frequently be performed at a lower cost and reduced morbidity than a surgical intervention. The patients’ anatomic abnormalities suggest what intervention to use for correction. For those with less severe abnormalities, corrections may only require a limited amount of strategic volume replacement. Some patients present with limited skin redundancy and rhytids, without eyelid malposition, limited lower eyelid fat bulging, limited skeletonization, and no appreciable malar dissent. 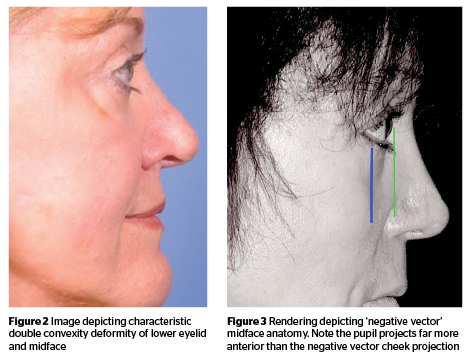 In these patients, acceptable results can be obtained with the placement of volume along the orbital rim (Figure 4). In a patient with more severe changes, with noticeable descent of the malar fat pad, the strategy of volume replacement is different. Volume is again placed along the orbital rim, but also to change the malar contour itself. Here the placement of volume is performed, in essence, to change the center of gravity of the cheek mound to a higher position. 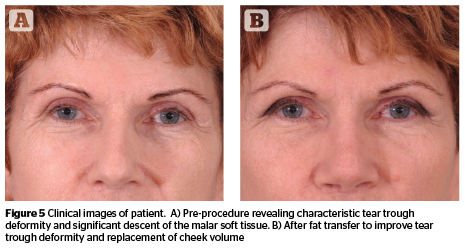 While the filler or fat expands the soft tissue envelope, a lifting of the malar mound occurs. A reduction of the apparent deepness of the nasolabial crease occurs along with an improved contour of the malar eminence. The carefully placed volume will fill-out the skeletonization of the orbital rim as well as the tear-trough deformity. 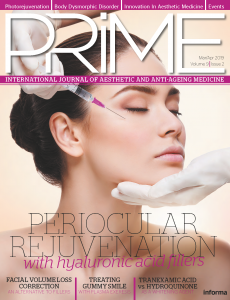 Hyaluronic acid fillers (HA) that have good spreading characteristics and less lifting characteristics are ideal for placement in the area of the orbital rim. They provide volume without the need of skeletal support. 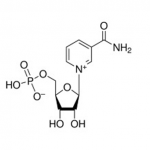 They are relatively forgiving and self-smoothing so that they can be placed with limited risk of creating any lumps. In the midface and in the lateral cheek, an HA with more lifting characteristics and less spreading characteristics can be placed that is long-lasting and provides not only volume but also structural support8. These materials are usually placed deep, above the level of the periosteum. With proper appreciation of the anatomy and technique of application, this can be achieved safely with the minimal risk of morbidity and complication. Autogenous fat can be placed similarly in the cheek area (Figure 5). When placed deeply, it becomes easy to perform fat transfers with good results and without morbidity9. 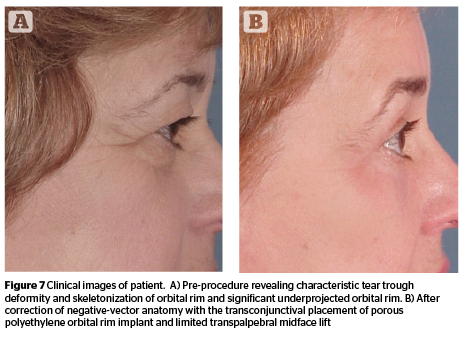 The placement of fat in the area of the tear trough should ideally be performed by practitioners experienced in the technique unless optimally placed lumps of fat will be visible through the relatively thin tissue of the eyelid and can only usually be removed surgically. Some practitioners are very skilled and do this routinely; while other skilled practitioners avoid using fat in this area. The safe application of volume is dependent on proper technique and appreciation of the local anatomy. The author usually injects HA fillers and fat in this facial area using blunt cannulas. It is the author’s opinion that the cannulas result in less bruising and at least hypothetically provide more protection against an intravascular injection. Excess local soft tissue and laxity can be treated through various surgical techniques: blepharoplasty, blepharoplasty with fat repositioning, and various methods of midface lifting that can be performed trans-palpebral as well as trans-temporal. Blepharoplasty should be considered when there are more advanced aging changes in the region with skin excess of the eyelid, large amounts of fat pseudo-herniation, and lid malposition. There is a wide range of opinion of whether blepharoplasty is best performed via a transconjunctival or transcutaneous approach. The decision about approach is primarily made based on the patient’s anatomy and previous history of blepharoplasty. The author’s usual ‘go-to’ approach in most lower blepharoplasty procedures is a transconjunctival blepharoplasty with a skin pinch to remove skin excess. It is the author’s opinion that this best preserves long-term orbicularis function. Most patients also undergo some form of canthopexy or resuspension of the orbicularis muscle. If the plan is to perform a midface lift, correct a lid retraction, correct an ectropion or place an implant, the author will at many times gravitate toward a transcutaneous blepharoplasty. 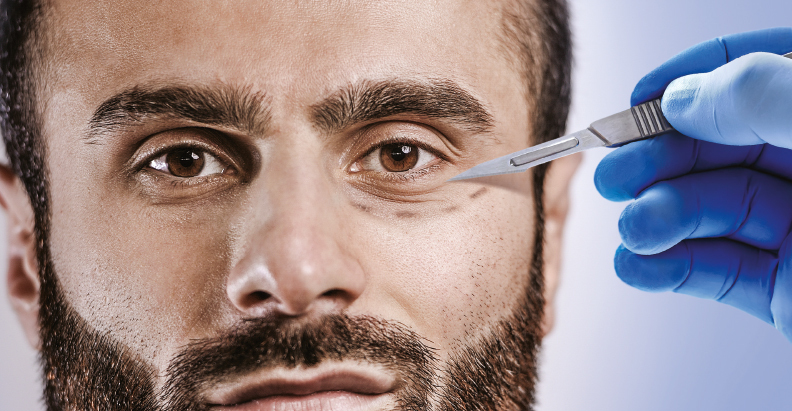 The placement of the transcutaneous incisions is usually lower on the eyelid at a distance away from the ciliary line, i.e., at least 4 mm in order preserve the pretarsal orbicularis. (The younger the patient, the closer the incision is placed towards the ciliary line.) The medial extent of the incision should be limited to preserve the buccal innervation of the orbicularis muscle. Until th e mid-90s, the surgical approach for the rejuvenation of the periorbital area was largely limited to lower blepharoplasty with resuspension of eyelid soft tissue, removal of excess skin, and removal of any bulge of orbital fat. There was a later modification of blepharoplasty developed by repositioning orbital fat over the orbital rim to serve as a biologic internal implant to camouflage the skeletonization of the orbital rim10–12. What was initially hidden by the SOOF was now covered by the repositioned orbital fat. If patients have a large amount of bulging orbital fat, some fat will be removed13. If the patient has an appreciable tear trough deformity, the author will remove the lateral fat pad, and reposition the nasal and central fat pads over the orbital rims. There are a number of variations to the procedures described as midface lifts. Some of the more involved techniques are undertaken through a trans-temporal endoscopic approach14,15. Some midface lifting techniques are performed with blepharoplasty and can be done either through a transcutaneous or transconjunctival blepharoplasty approach16. The goals of the mid-facelift are to correct lower eyelid contour and position. They are also directed to improve the lid-cheek junction and to reposition the malar fat pad (Figure 6)17. There are also a variety of custom implants available for the midface and the orbital rim made of several biocompatible materials18. In patients with lower eyelid malposition and a negative vector relationship, particularly if they have had a previous attempt at surgical correction, the author will augment the orbital rim with a solid orbital rim or malar implant. The author has experience with porous polyethylene and silastic implants that can be placed through transconjunctival or transcutaneous approaches. This is performed to correct the negative-vector skeletal abnormality (Figure 7). Patients are now benefitting from the many advances for the correction of age-related concerns of the lower eyelid and midface. The ability to provide the early and initial correction of volume deficiencies has dramatically changed the approach to the area. When such volume corrections are coupled with other interventions, such as blepharoplasty and midface lifting, the spectrum of midface aging can be comprehensively approached and successfully improved.